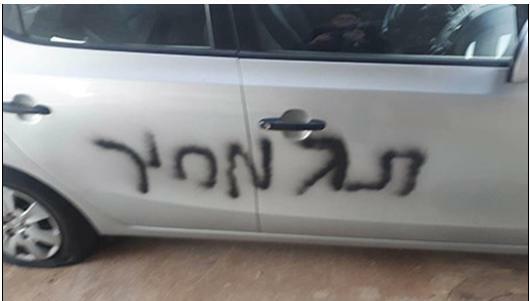 Unknown far-right vandals spray-painted graffiti on the walls of homes and cars in the village of Yafia, near Nazareth, overnight between Thursday and Friday, October 25-26, and caused other damage to cars in the village. The Yafia Local Council, headed by a Hadash activist, said this was the second hate crime carried out there in the last two years and issued a statement in which it places full responsibility on the Likud government for apprehending those who carried out the crime and bring them to justice. “The Yafia Local Council calls on all reasonable people in Jewish society to raise their voices against these heinous acts. The fascism that starts with Arabs will continue until it reaches the reasonable members of Jewish society. Enough with racism!” the statement said. Commenting on the incident, Hadash MK Yousef Jabareen (Joint List) said: “The attacks of ‘price tag’ gangs have been continuing against the Arab public for a number of years and the police have shown shocking impotence.” Jabareen added” “This is the second hate crime in Yafia in the past two years. The lives and property of Arabs is not up for grabs, and it is unacceptable that the police are unable to apprehend to perpetrators… The Israeli government bears responsibility for the continued attacks and for bringing the perpetrators to justice,”. The Chairman of the Joint List, MK Ayman Odeh (Hadash), took Prime Minister Benjamin Netanyahu and his cabinet to task for incitement that is encouraging extremists, and said those in government bear responsibility. Odeh said that, in the context of “racist local government [electoral] campaigns the Arab population is becoming a punching bag for the right wing.” Local elections around Israel are scheduled for next Tuesday, October 30.